On Saturday, Howard and I were treated to another tour with our friend, Pinchas Nahmani. 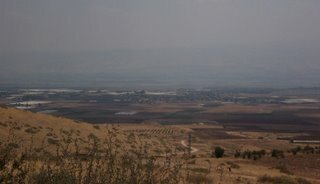 Because of the situation to the north, including Teveria being hit with katyusha rockets today, we headed south. First we drove through the Parvanot Community area south of Bet Shean. 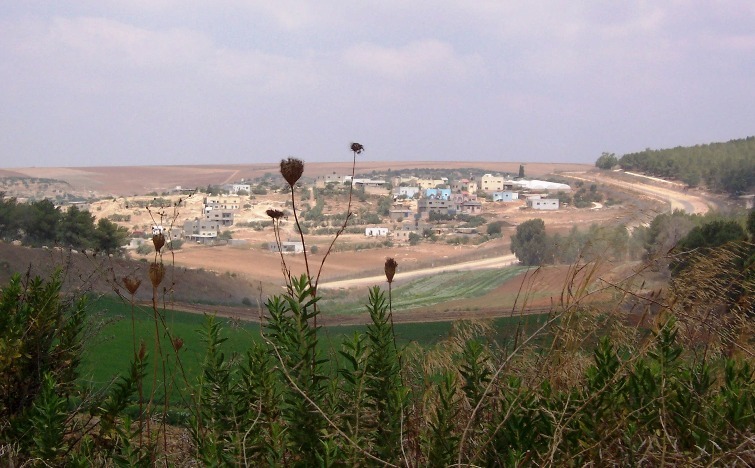 These settlements were mostly started after the War of Independence and were on the border for many years. 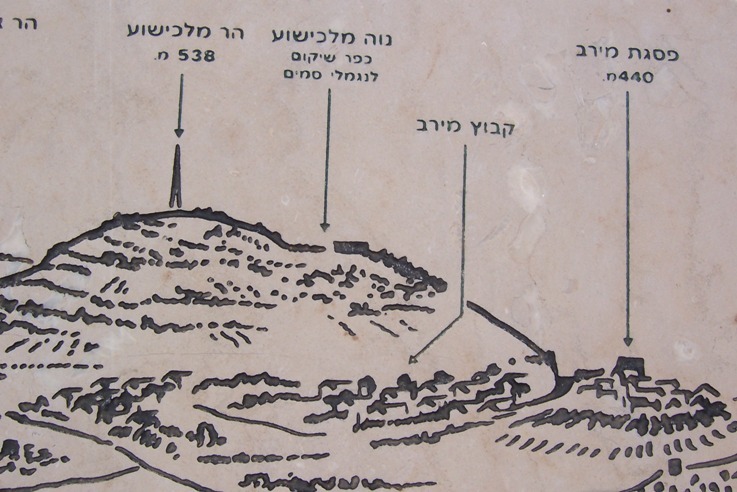 Sde Eliyahu and surrounding areas stared in 1936 to 1939 and the rest after 1948. 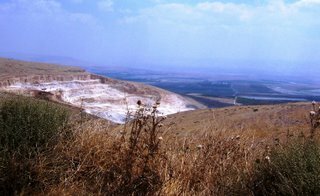 Most were settled by immigrant Kurds who were into commerce than farming, but after they came to Israel, they managed to do both. 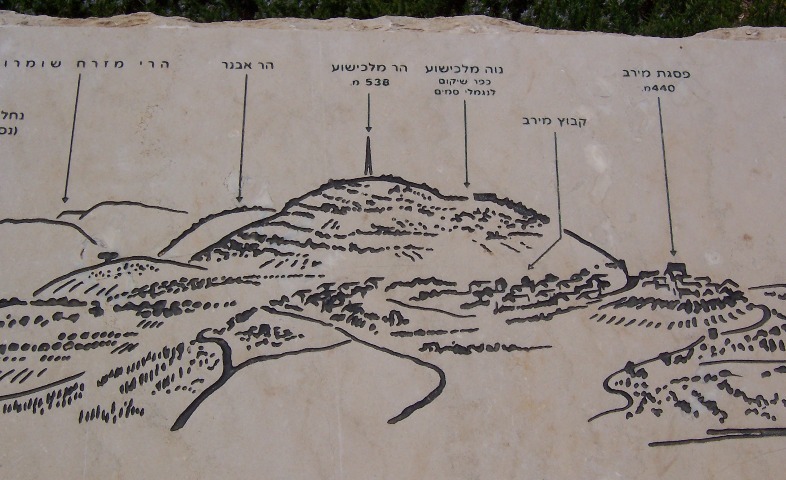 It is a religious area, and Pinchas told us that they have an eruv that stretches from south of Bet Shean down through the settlements, making it easier for area residents to walk back and forth between the communities on Shabbat. 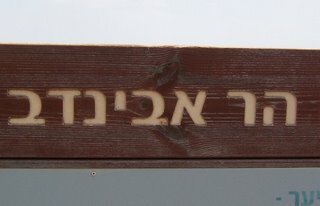 We needed to make a bathroom stop, but there was no public place to stop as this is a religious area and all places were closed for Shabbat. 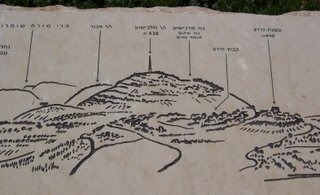 So the call of nature was answered when we were out of the communities and started going toward the SE part of the Gilboa Hills/Mountains. As we drove up, we had a nice view of the Parvanot communities and the hot houses they have. We also saw a reservoir above them, which holds water and is also a good place for people to visit and picnic. As we climbed higher we passed a limestone quarry on the right, belonging to Kibbutz Beit Alfa. 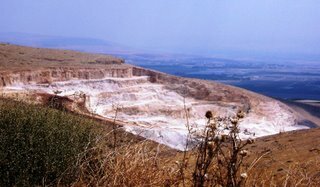 The open jagged hole of the quarry is not visible from the valley below because the workers purposely left a wall on that side so the ugliness could not be seen from below. The far edge of the picture is where the wall is that hides the quarry from below. Our goal was the top of the Malkishua hill. 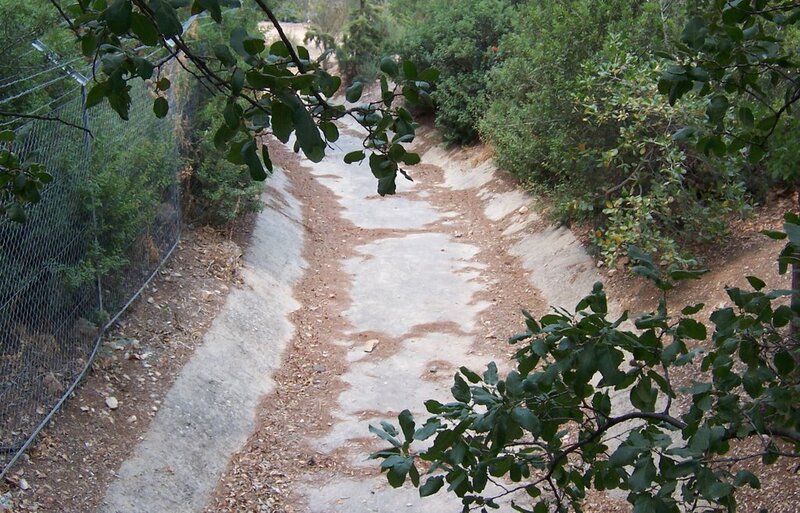 At one time, people tried to maintain a small town on the top of Malkishua. It is a beautiful area with fantastic weather—not too hot in summer with lovely breezes and not too cold in summer as it is not high enough to get snow. On the way up, we stopped at an overlook created in memory of a 16-year-old girl named Aliza who was killed by terrorists as she was returning to her home in Meirav, a small town just below Malkishua. 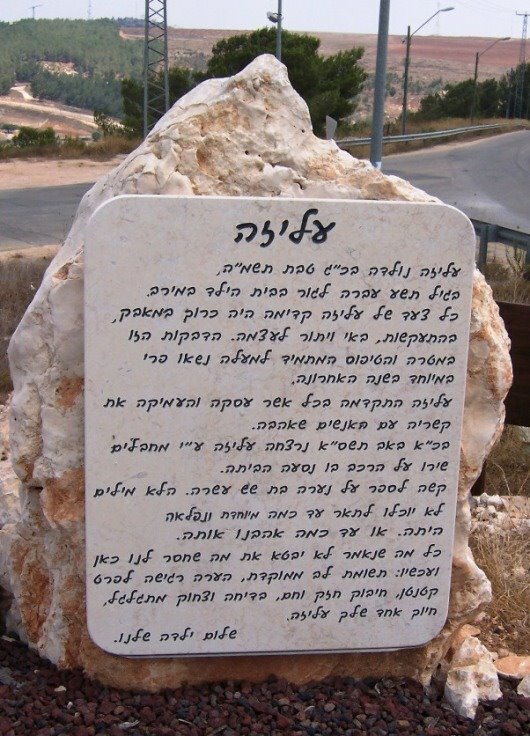 This memorial has white broken-up limestone on the ground as well as small very lightweight black stones of tuff (volcanic stones mined by Kibbutz Merom Golan where I used to live) which line the central pathway. You can see our rental car, a Hyundai Getz, in the background. This picture was taken from the area where the memorial stone for Aliza is, looking backward. 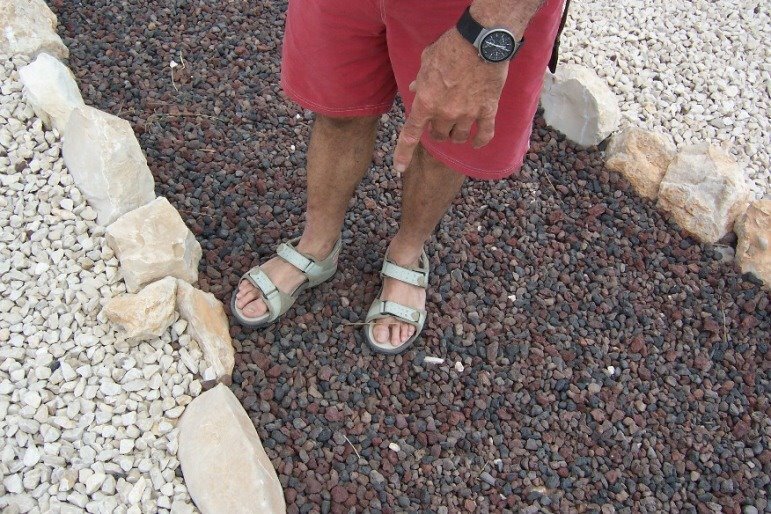 Here is a closeup of the volcanic lightweight tuff next to the limestone.... Those are Pinchas' feet! Young plants and a sign memorializing Aliza also mark the spot. (Taken without telephoto lense.) You can see the army path on the right. A patrol vehicle drove by, inspecting, as we were at the overlook. 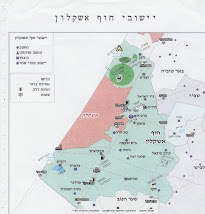 As you can see, the boarder to the West Bank and the village are very close. Until a few years ago, the border was not so carefully delineated but out of need, this has become the reality. 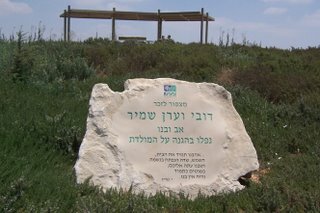 Just to the east is a forest planted by the Jewish National Fund. 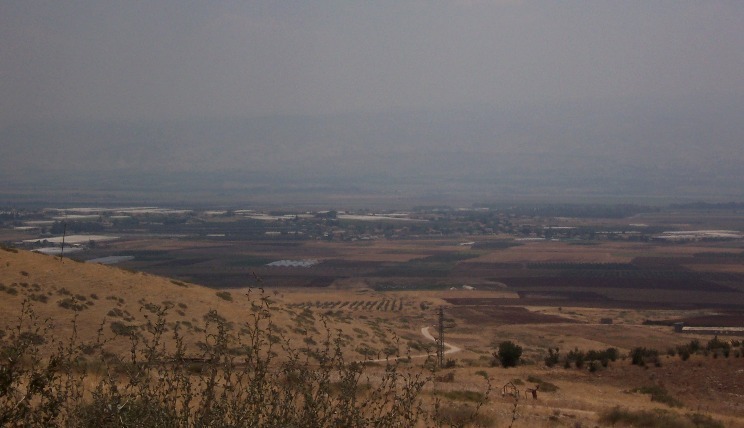 We could see another Arab village in the distance and another Israeli one a bit more to the East on the Gilboa hills. 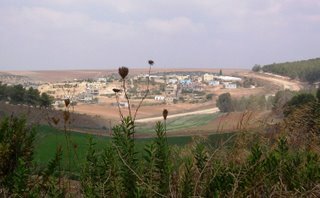 The town Malkishua on top of Har Malkishua was not a success, but not a drug treatment center flourishes on the site. As we drove up, we passed a cattle grazing area. When cattle eat the dry grass, they reduce the risk of fire in the dry season. The gates to the center were closed, so we drove around until we got to a secure area and had to make a U-turn. 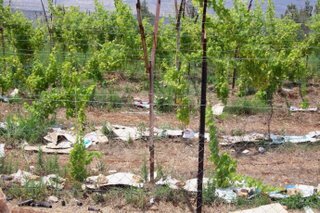 We did see organic gardens up here too, a picnic area for visitors, planted whose roots were covered by torn up cardboard which helps keep the water from irrigation (and rain in winter) near the plants. 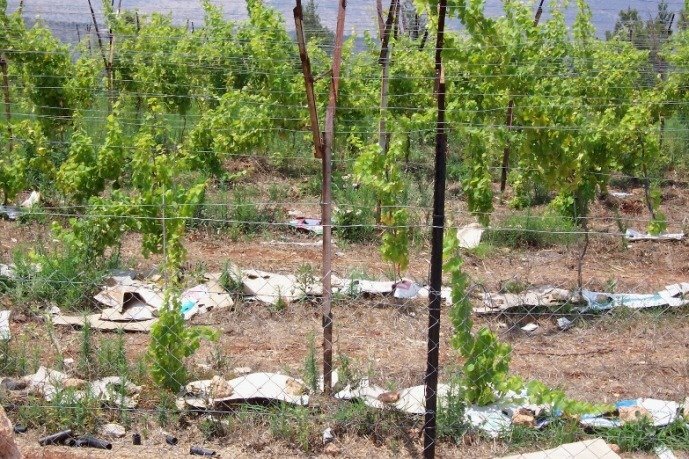 Organic grape vineyards with cardboard over the roots. As we drove by, we saw groups of people walking around, working, and sitting together under a covered area. The drug treatment center did have an electronic fence around it and a gate (closed when we drove by) as it is very close to a West Bank town and need to protect the residents. As we drove down from Malkishua and passed Meirav, the back of the “welcome to Meirav” sign had a “good-bye” with the travelers’ prayer on it. We also saw some wide swatches of open area, and Pinchas said that these were fire lines that also coincided with divisions among agricultural fields. As we drove by, we saw a modern dairy farm and cattle area. 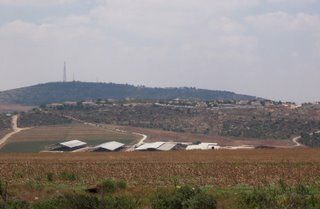 Below are some of the modern dairy farms with Malkishua on the hill in the distance center left. 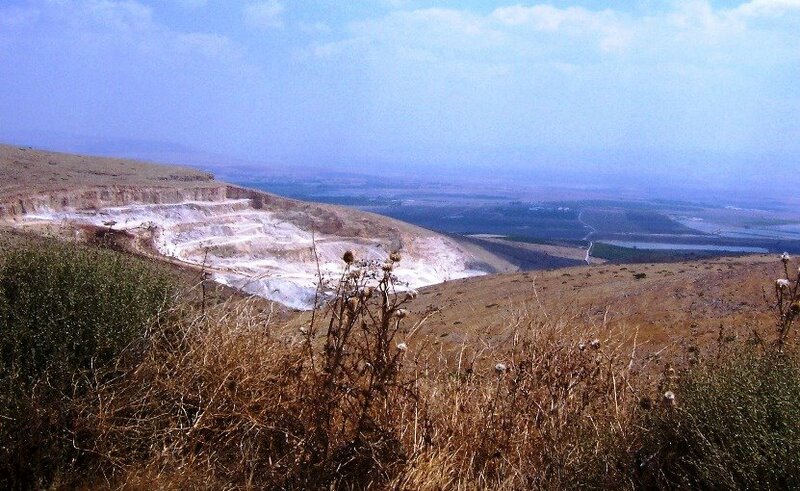 Pinchas said that in the past 20 years, the environmentalists have developed a strong voice in the country. 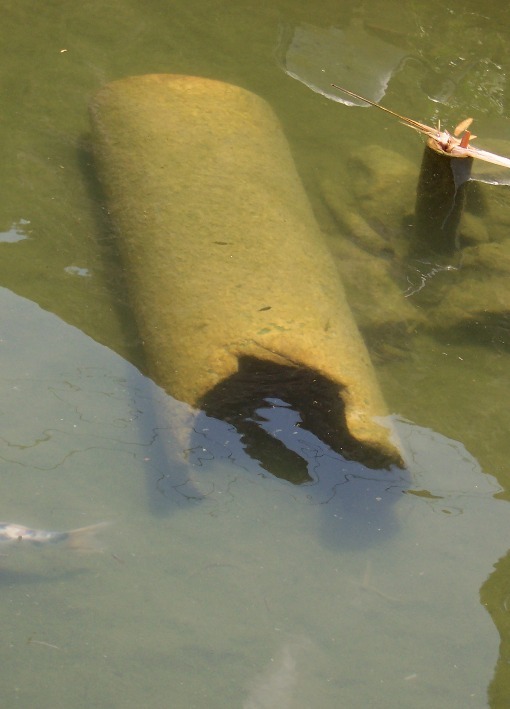 One thing that really concerned them was the waste of water in dairy farms and cattle raising. Dairy farms were asked to put in new systems that recycled water that they used, but most farmers complained and said that they could not afford to do so. As a result, the government changed its approach and said that it would give incentives (monetary grants) to those putting in new systems like we got for buying our Toyota Prius hybrid car. Along the way, we saw a number of these new cattle sheds. Pinchas said that last year an Israeli company built such a dairy farm in China. China was interested in the system and invited the company to explain things. The company built the first one at cost, with hopes that there will be such an interest that the rest it can build and make a profit. We stopped at a few more viewpoints/park-lets. The first was on the Avinadav ridge. Of course I had to stop and take a picture of the signs because of Avi and Nadav’s names (my two sons)! The trees there were also from the Jewish National Fund. 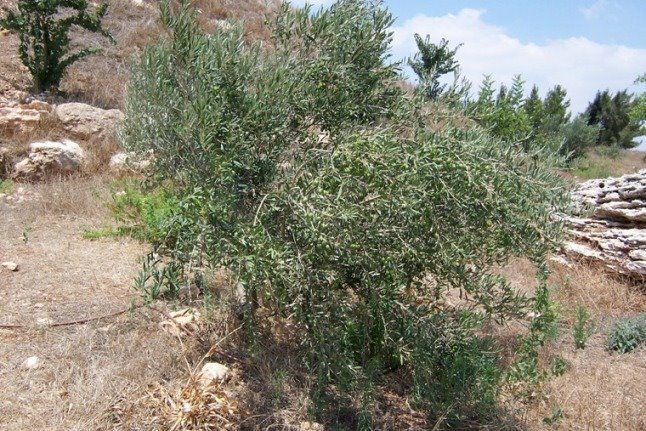 While the JNF used to plant many kinds of trees, they have started to focus more on fruit trees so visitors can enjoy the trees and the fruit they produce also. At the Avinadav stop, we saw figs, olive, and carob trees as well as lavender bushes as well as other spices. 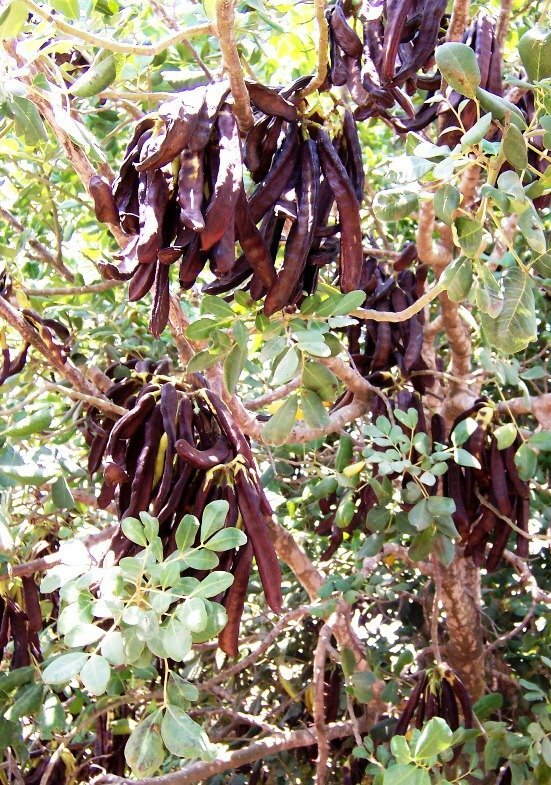 I LOVE the fruit of the carob tree. (Hebrew = Heiruv) It is a bit early for it to be in season, but we did find one tree whose fruit was close to ripening. When the carob fruit is ripe, it actually is dried out….is no longer green on the outside or inside on the long wide beanlike fruit. One chews it carefullyas it is a bit woody to not bit into the seeds and hurt a tooth. A half mile farther down the road and on the opposite side was another overview. We got out and walked up the hill. 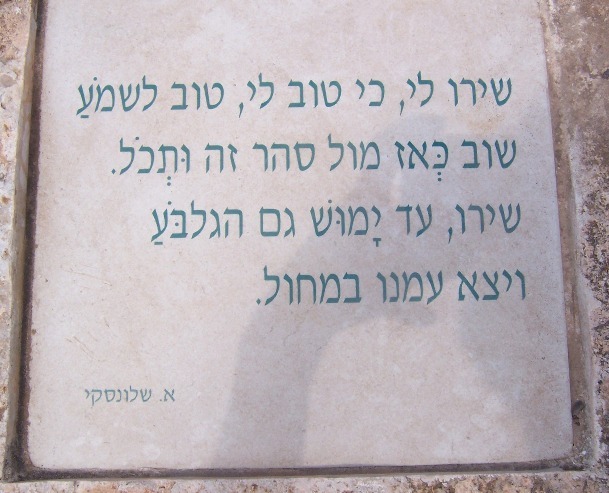 Along the pathway were stones with poetry about the Gilboa hills written on them. Here is an example of one. At the top we saw that this place was built in memory of a father and son. 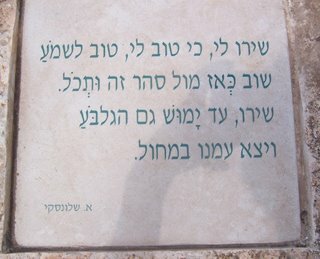 The father, Dubi Shamir, was born in February 1947 and died in 1977 while in the military. The son Eiran was born in 1974 and died 20 years after the father, also in defense of the country. It was poignant and sad…and the reality in this country, unfortunately. The view from here was spectacular as we could see all around. 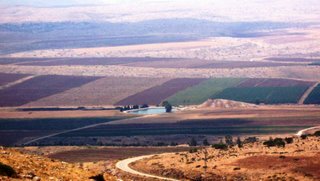 We drove down the middle of the Gilboa range, down to Kibbutz Heftzi-ba, which is so close to Kibbutz Bet Alfa that it is hard to see where one ends and the other begins. 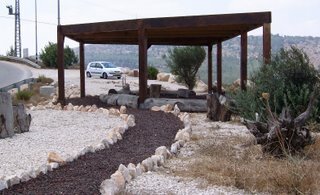 A Japanese organization whose members support Israel built a lovely Japanese garden on the edge of the Kib butz. Here are Howard and Pinchas at the entrance to the gardens. 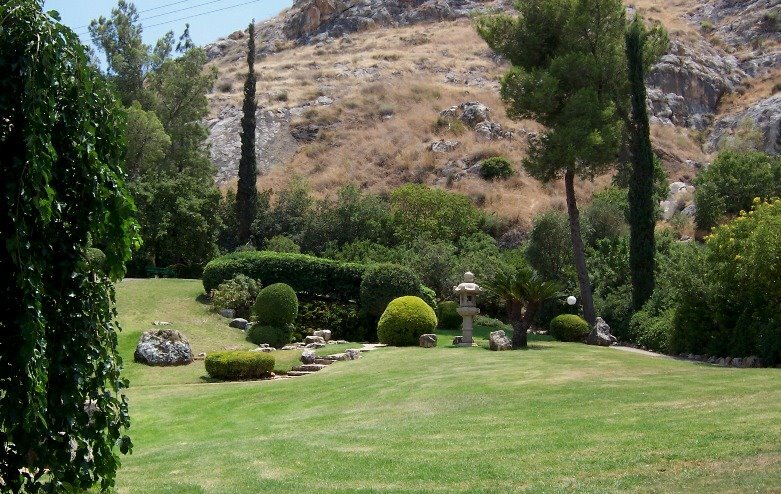 Here is a general overview of part of the gardens. 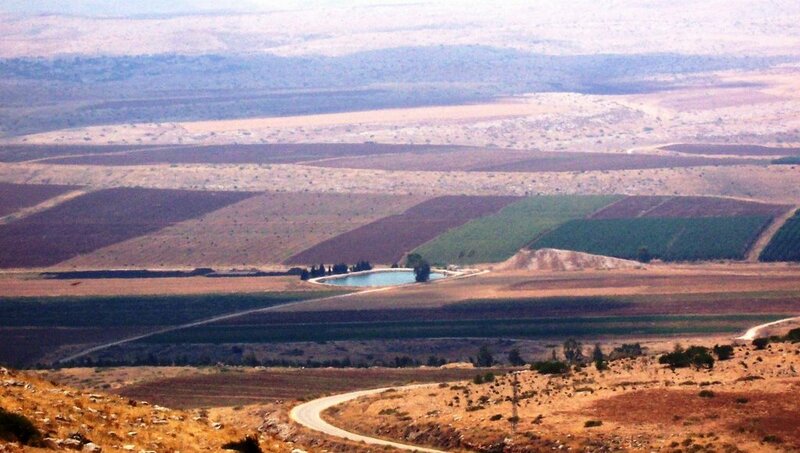 It is unusual to see so much grass in parts of Israel because of the cost of irrigating it. and a house called Beit Mokoya or Mokoya House. 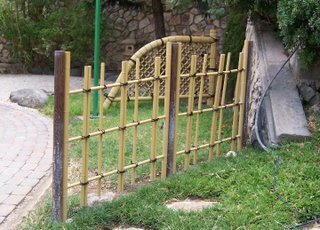 Real bamboo grows to the right of the entrance to Beit Makoya and several fake bamboo fences are close by too. 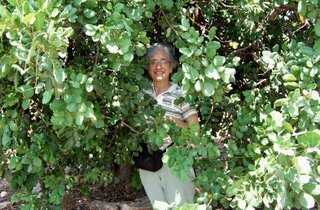 The park in dedicated to a professor from Japan. 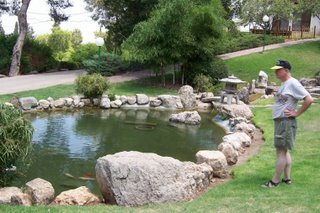 In addition to statues, bushes trimmed in the style of a Japanese garden, and grass, there is also a fish pond with many different colored goldfish. 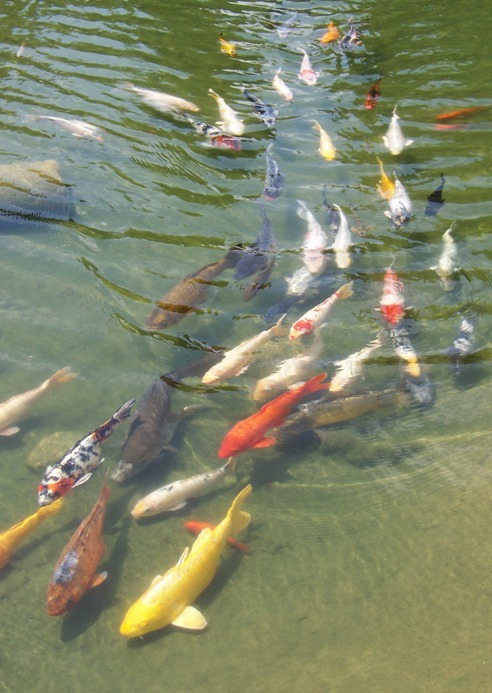 There is a kibbutz in the Upper Galilee not far from Kiryat Shmona which now raises such fish for export to Japan. Right now demand exceeds supply. Inside the pond are several tubes when the fish often lay their eggs. 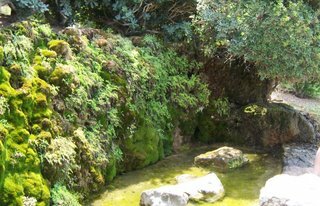 There is also another small pond with water dripping down the walls into the pond. This picture does not really do it justice...but there are several small sprinklers near the top...it is delightful to watch. Members of the group have lived on the kibbutz for years and maintain this garden, an unusual site for Israel. There were no signs pointing to this garden, so unless one knows that it exists here, no one would know to come and visit. 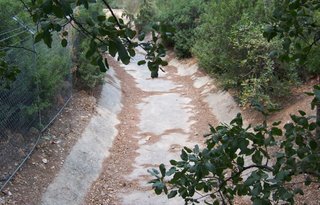 There is a channel going through the edge of the garden for water from the Gilboa to go when heavy rains fall. 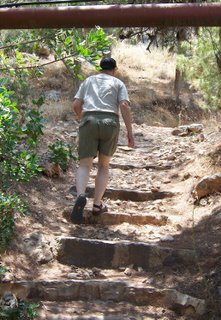 There are also two paths up from the garden to the Gilboa Hills, and 4-wheel drive vehicles can go up the rocky paths too. We might try climbing it on another trip, when we have more water and it isn't as hot...thought it was probably just in the high 80s that day. 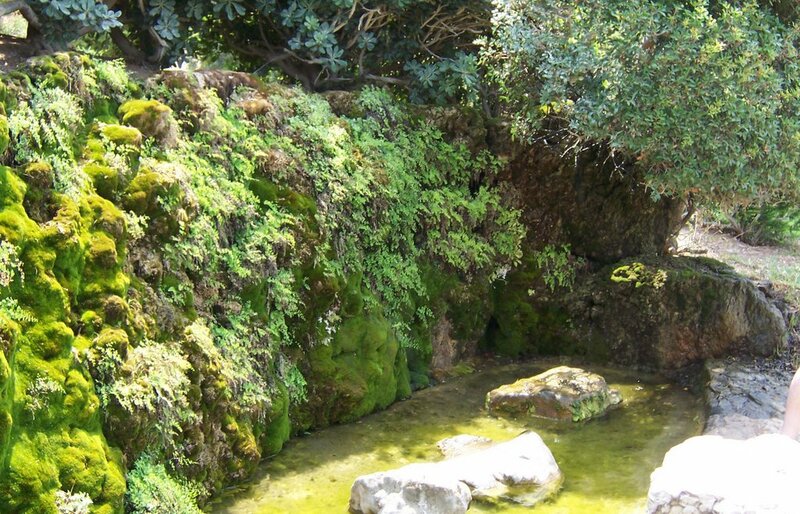 We skipped going to a local non-touristy springs for swimming as Dalia was awaiting Shabbat lunch for us. She had 3 extra visitors--a co-worker from Teveria, Valerie’s mother-in-law, and Valerie’s 5-month-old son David. While we were gone, katyushas had landed in Teveria, a block from Valerie’s home--she actually saw it hit and she looked out of the window when she head the “boom.” Dalia called and invited Valerie to come to stay with them, as they were more to the south in a rural area. Valerie was happy to come. A few hours after she did come, more katyushas hit Tiberius, a block or two on the other side of her home! As we headed back home, we noticed that a lot of cars were heading south. Many Israelis had gone to the beaches on the Kinneret (Galilee) for the weekend. With the first terrorist attack, the beaches were closed, so they headed home. Also, some residents headed south to stay with friends or relatives in the center of the country. It was the 3rd day of the war in the North. Wow. Gorgeous pictures. I would love to go back to Israel... I don't know if fate will bring me to ever live in Israel for a time (rather than just visiting), but I think I would love to were the opportunity to present itself. 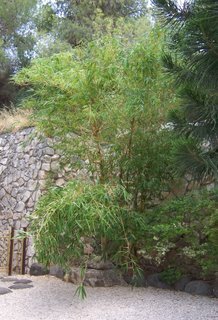 I didn't know the Makuya had a garden or any sort of permanent establishment in the country.. I'd be curious to check it out. Thanks again for sharing your pics and story. 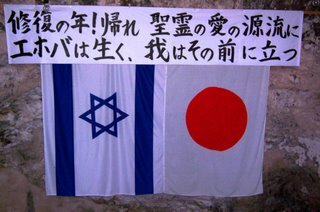 PS If you'd like a translation of the Japanese signs from the photos, or of anything else, please feel free to ask and I'll do my best. Never thought I'd see a Japanese garden in Eretz Ysrael. 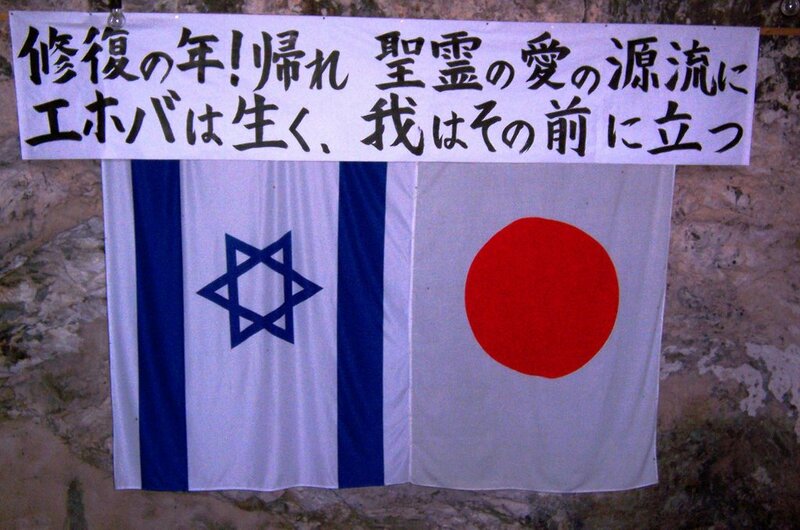 Actually, finding Japanese Christians was more shocking. All of my Japanese friends are Shintoists as far as I know. I also found this from a Wikipedia article. The Garden was nice. I plan to have something like that when my Gasshou-zukuri farm house is finished. It's still in the planning stages at the moment. 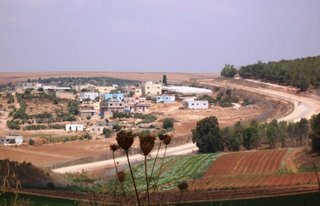 http://en.wikipedia.org/wiki/Heftzibah). 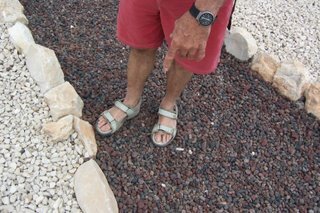 It is so great to read about "my" kibbutz and see the photo's from your visit there (the quarry, the Japanese Garden, the views from Mt. Gilbo'a) - many memories pop up (1982 and 1988). Thanks! Lived there in 1981-82, fun time. I probably married a Japanese lady because of how impressed I was with the Makuya. 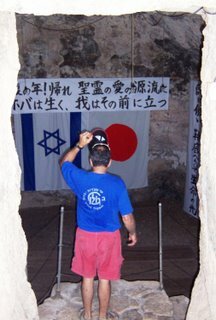 I lived in Israel from 1971 to 1974, attended Ulpan WUJS in Arad and met my first husband there. 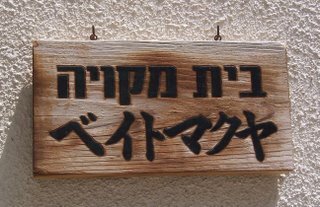 We became members of Kibbutz Merom Golan. 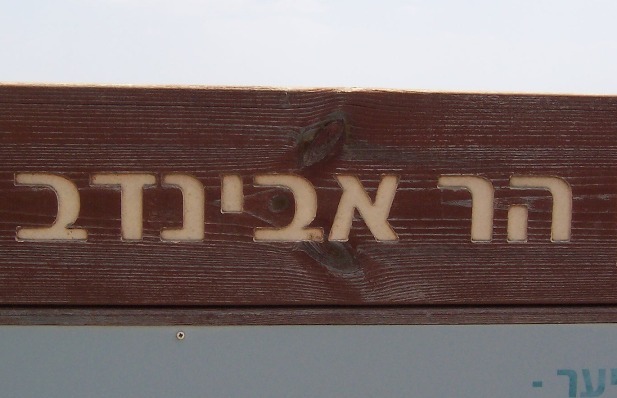 Our daughter Timna was born in Afula in June, 1973. 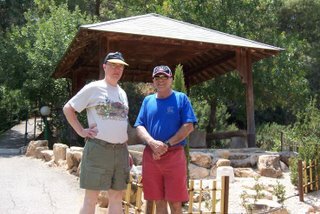 We were evacuated under fire during the Yom Kippur War. We returned to the US in 1974 to help my mother-in-law. 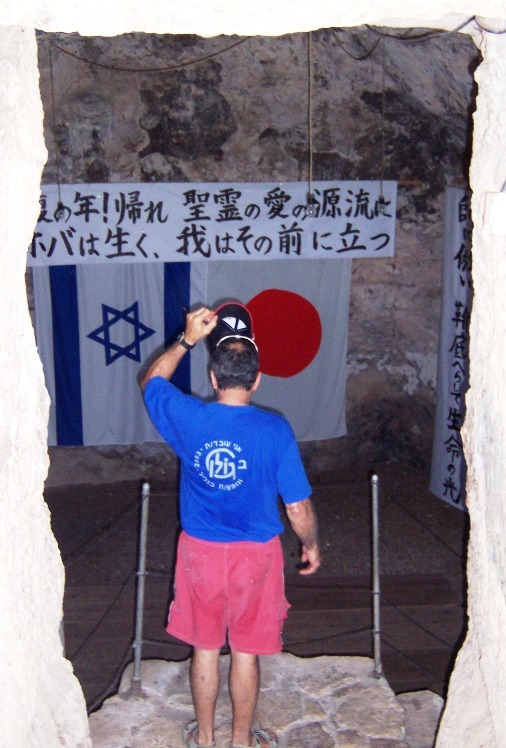 Since 1997, I've been to Israel 16 times, and at least once a year since 2002 after remarrying. We have volunteered in Kiryat Malachi through the Jewish Federation of Greater Seattle's involvement in TIPS as in May 2009 I became co-chair of the TIPS partnership. Seattle left the partnership in 2015. I still hope to find a way to continue to connect with Israel and the people in Kiryat Malachi and Hof Ashkelon. Meanwhile, I've traveled to some amazing places the past two years, including Cambodia, Laos, and northern Vietnam, Easter Island, Patagonia in Chile and Argentina, and Tierra del Fuego, and just returned form an amazing Handicrafts trip to Guatemala. I'm fluent in Spanish and street Hebrew.